On ta-guru home page just above chart, you have text box called 'ticker' where you have to type name of symbol you want to display. While you are typing text search is done in background, so you will see results in dropdown list. When you find desired symbol just select it in list and chart will display its data. In order to display indicators on chart you have to first choose symbol. From chart's toolbar select button 'indicators'. Dialog box with list of all available indacators will be opened. 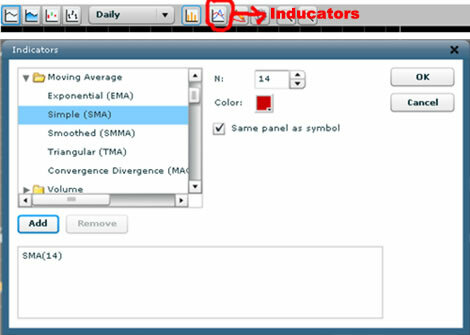 Choose indicator and its configuration will be displayed on the panel next to indicators list. Configure indicator or leave default parameters. After that press add button and indicator will be added in basket. Close dialog by choosing 'ok' button and you will see indicator on chart. In order to display drawing tools on chart you have to first choose symbol. From chart's toolbar select button 'drawing tools'. Toolbar with drawing tools will be displayed. 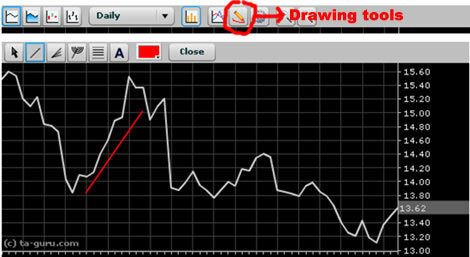 Select desired drawing tool and draw it on chart. When you finish with drawing 'close' button to return to standard chart's toolbar.